Advance Capital Management’s president and chief investment officer, Christopher Kostiz, provides his key economic and market insights from the most recent quarter and for the new year. 2018 proved quite difficult for investors as most investments produced a negative return across styles, sectors and asset classes. Even the most conservative investments were not immune to the market’s pressure. Typically, investors are rewarded for taking risks and investing in the capital markets; this past year was not the case. While it is difficult to eliminate risk, our job is to manage it and try to reduce it as best we can through diligent research and manager selection. Reflecting on the year, January proved particularly strong for global stocks as the S&P 500 Index jumped about 8 percent in the month. New tax cuts at the individual and corporate level fueled renewed optimism among investors. At the same time, the Federal Reserve made it clear they intended to “normalize” interest rates after several years of historically low rates. From late January through early spring, investor optimism began to wane. Higher interest rates and growing international trade disputes spooked investors, which led stocks to decline about 10 percent. By the end of the third quarter, the combination of very strong corporate earnings and modest trade resolutions led investors to push domestic stock indices back to all-time highs. This more sanguine environment turned sour during the fourth quarter. Again, concerns mounted over the strength of corporate earnings, rising interest rates and heated trade rhetoric, which led investors to run for the exits and trigger a precipitous market decline. The major stock market indices around the world posted negative returns for the year, with foreign and emerging markets getting hit the hardest. At the same time, the steady rise of interest rates led to an erosion of bond prices and resulted in poor returns for even the most generic bonds. Reflecting on this erratic environment of 2018 and looking ahead to what it means for the economy and capital markets in 2019, there are some concerns and opportunities for investors to ponder. Could an economic slowdown be in the works? First, on the economic front, while overall activity remains quite strong, there are some indications that a modest slowdown is occurring. The drivers of growth have been housing, manufacturing and record levels of employment. Over the past year, the economy has added over 2 million new jobs. The unemployment rate has fallen to the lowest level since 1969, with the fewest unemployment claims in about 50 years. A tighter employment picture has lifted wage gains to around 3 percent, the fastest pace in about 10 years. After several years of growth, the housing sector is showing signs of a slowdown. Recent data suggests rising borrowing costs and elevated home prices is crimping demand in all four regions of the country. Still, steady job gains and elevated consumer confidence should help underpin demand. Finally, the latest reading on manufacturing activity from the Institute of Supply Management (ISM) points to strengthening conditions in the sector despite heightened trade and political uncertainty. Four of the five underlying components of the index increased in the latest report. Trade tensions with China appear to have done little to dent demand for manufactured goods so far, which could be a positive for production activity over the near term. Although current economic conditions appear strong today, there is no shortage of uncertainty and potential volatility waiting for investors in the new year. To begin, the Federal Reserve (Fed) has raised interest rates nine times over the past three years, reduced its balance sheet by about $500 billion and signaled more interest rate hikes are likely. While still modest by historical standards, higher rates have already helped push down stock prices and cooled some inflationary pressures. If the Fed pushes too hard on rates, both the economy and capital markets could suffer. Geopolitical risks, highlighted by an ongoing trade spat with China, appear far from any concrete resolution. Concerns that the U.S.-China dispute could escalate into a full-blown trade war is keeping investors on edge. Finally, after almost 10 years, the bull market in stocks and economic prosperity is long in the tooth and likely coming to an end. While these signs might appear a bit ominous, they are somewhat offset by low unemployment, solid economic growth, strong corporate earnings and robust consumer sentiment, which should persist in the year ahead and help buffer some of the downside pressures. 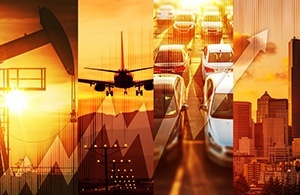 After many years of above-average returns in many asset classes and a sanguine economic environment, it appears volatility and uncertainty have returned. Although stocks may continue to struggle a bit as expectations are reset amidst higher interest rates and an expected slowdown in corporate earnings growth, we believe there are opportunities in stocks now that valuations look more reasonable. Meanwhile, after a dismal year for bonds, we are optimistic that the Federal Reserve will moderate their interest rate hikes this year, leading to better returns in bonds. In general, we expect modest returns for the markets in the coming year with potentially higher volatility. Along the way, we are working diligently to navigate these difficult markets and provide the best possible advice to clients. Being informed about the potential outcomes and having an appropriate investment plan in place will help investors weather the unexpected. Investments are not insured, and may lose money. Client should be prepared to bear the risks associated with investing. ©2015 ADVANCE CAPITAL MANAGEMENT. ALL RIGHTS RESERVED.